Cold Eyes stole the show at July’s box office in Korea. According to the integrated ticket sales network of the Korean Film Council, Cold Eyes added 74,713 admissions, exceeding 4.72 million in total as of July 23rd after Secretly Greatly recorded nearly seven million admissions and Killer Toon sold over one million tickets, the first time a horror movie has done so since Death Bell. Cold Eyes has crossed New World (4.68 million) and now holds the fourth place among Korean films released this year after Miracle in Cell No. 7 (12.81 million), The Berlin File (7.16 million) and Secretly Greatly (6.95 million). Cold Eyes was released on July 3rd and ranked first at the box office, relegating The Lone Ranger, which stars Johnny Depp and was produced by Jerry Bruckheimer. The thriller continued to win a tough box-office race with Hollywood blockbusters such as Pacific Rim, a Guillermo Del Toro film, during the month. Cold Eyes succeeded in grasping audiences’ attention thanks to its star-studded cast including JUNG Woo-sung, SEOL Kyung-gu and HAN Hyo-joo, interesting material of a police surveillance team and a suspenseful screenplay. In particular, JUNG played the villain of the piece for the first time in his life. Although NEW is a latecomer among the four biggest film distribution companies in Korea, it has continued to stay hot on the strength of Cold Eyes’ performance. On the other hand, the early box-office performance by Mr. Go by KIM Yong-hwa was somewhat disappointing. KIM became a star director while directing three consecutive box office hits – Oh! Brothers, Take Off and 200 Pounds Beauty. The production budget including marketing costs for Mr. Go reached a whopping KRW 25 billion (USD 22.5 million). The baseball-playing gorilla film premiered on July 17th and drew only 540,411 moviegoers (730,000 in total) at 788 screens across the nation on its opening weekend. Mr. Go earned positive reviews for the birth of Ling Ling, a gorilla character created entirely through Korea’s prowess in 3D technology. But the film failed to secure many 3D theaters, which can be a hurdle to its box-office run. However, it is premature to call Mr. Go a box-office flop. This is because KIM’s previous works were slow starters as they failed to top the box-office chart in their opening weeks but, in the long run, became box-office hits thanks to strong word of mouth. Take Off, which recorded 8.53 million admissions made its debut at second place after Haeundae on its opening weekend. But on the second weekend, Take Off topped the chart. Similar phenomena occurred to 200 Pounds Beauty (6.62 million admissions) and Oh! Brothers (3.14 million admissions). Mr. Go was released in China on July 18th and topped the box-office chart there by earning RMB 20 million (about USD 3.26 million) including ticket sales from paid previews. This fact may help Mr. Go perform better in Korea. The point is whether or not Mr. Go will be able to secure a good number of screens in fierce competition with other summer blockbusters such as The Wolverine, Snowpiercer and The Terror Live. In the case of imports, World War Z enjoyed a strong box office performance in July which continued from June when the film was released in Korea. World War Z exceeded five million viewers, becoming the fifth film to do so among films released in 2013. Its ticket sales in Korea stand at around USD 30 million, higher than those in France, Germany, Australia, the U.K. and Mexico. Pacific Rim, which used a typical “hit-and-run” strategy, opened on July 11th and marked 2 million admissions for its first ten days across the nation and then began to ebb. Meanwhile RED 2 wrote the most successful box-office story among foreign films released in July. On its opening weekend, RED 2 drew 830,000 audiences. The action thriller recorded close to 1.3 million admissions across the country by July 23rd. The first installment of RED premiered in October 2010 and attracted only about 480,000 viewers in Korea. Surprisingly, RED 2 put on up a good show by recording a score that is double the final score of the first part only in four days since its release. Korean star LEE Byung-hun played a key role in boosting early tickets sales regardless of the film’s qualities. 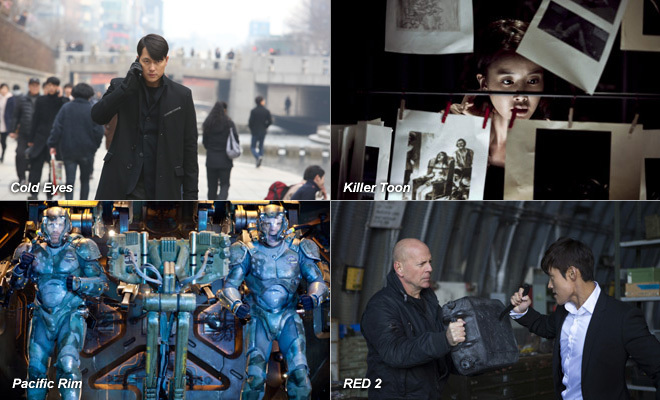 All eyes are on the box office run of RED 2 in Korea in the coming days and weeks as Snowpiercer, probably the most anticipated film among Koreans in 2013, and The Terror Live starring HA Jung-woo, will hit screens nationwide in August.